It’s been over a year now that I’ve wanted to redo a dumpy old chair and make it beautiful and when we bought the new house we finally had the space to put a beautifully upholstered chair! Quite honestly we have the space for a dozen upholstered chairs but after my experience doing the first one I quickly learned that they are expensive! Throughout my visits to yard sales, garage sales, reuse and salvage centers I promised myself that I would hold off on buying until the perfectly right priced chair presented itself. I found this easy chair at the Habitat For Humanity ReStore in Corning, NY for the bargain price of $30. This fabric took me about 24 solid searching hours over the course of a week to find and I ended up purchasing from Joann Fabrics.com because there was a coupon. 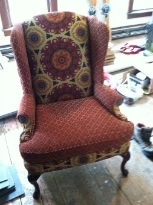 The chair needed 7 yards of the medallion print and 2 yards of the red/gold diamond print…. I purchased ALL of my fabric for $130! If I had gone with the $70 a yard fabric, it would have cost over $600 bucks! So you can see where costs add up. My upholster charged about $375 to add padding to the inside and outside wings, make a new seat cushion and upholster the chair aaaaand it took her 5 months to complete. Final cost was around $550, which if you looked online you could find a really nice chair at that price… just watch out for the shipping costs. Or if you’re up for it… cause yourself a whole bunch of stress and time and create your very own custom chair!